With the Year-end fast approaching, there are some versions of Dynamics GP that are no longer supported. In 2018, any release prior to and including GP 2013. 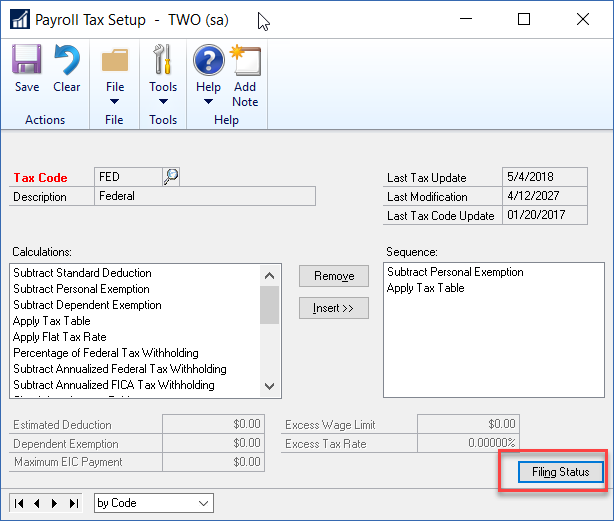 If you are using the payroll module in any of these releases you will not receive the Payroll Year-end Update hotfix that Microsoft releases in November 2018, and you will also not receive any automated Tax Table Updates for 2019. Luckily there are no changes to the W2, W3, 1095-C forms or the electronic filing for 2018, so you do not need to be concerned that you cannot install a year end update in 2018. And the good news is that you can manually update the tax tables. Here’s how. Do not make any changes to the Payroll Taxes until AFTER you run the Payroll Year-end Closing and have verified that the Year-end Wage File is correct by verifying that the information printed in the Year End Wage Report is accurate. You also want to make the changes to the Payroll Taxes BEFORE the first payroll of 2019. Go to Administration area page > Setup section > System section > Payroll Tax. 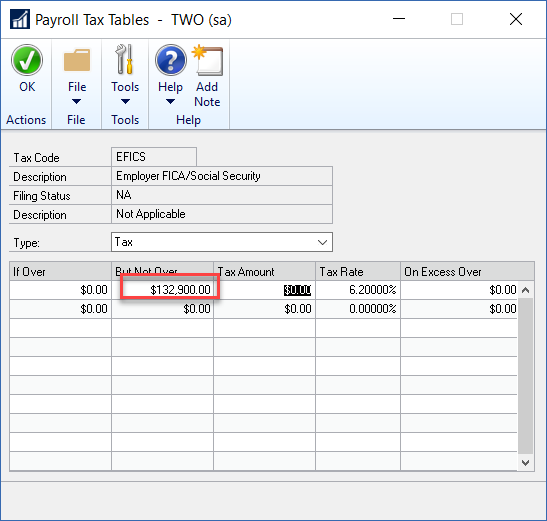 You do not need to be signed into GP as the SA user, but the user does need to be assigned to a security role that has access to the Payroll Tax Setup windows. 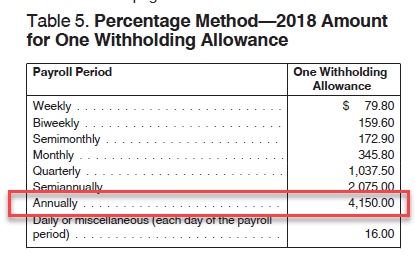 The Payroll Tax Setup window includes all tax codes for each individual State, FED for the Federal Taxes, EFICM and EFICS for the Employer FICA Medicare and Social Security, and FICAM and FICAS for the Employee FICA Medicare and Social Security, as well as EIC for Earned Income Credit if needed. The Social Security Administration announced that the maximum amount of wages subject to OASDI tax will increase to $132,900 for 2019 (the limit was $128,400 in 2018). You will need to make changes to both the EFICS and FICAS tax codes. The changes are made in the same way. 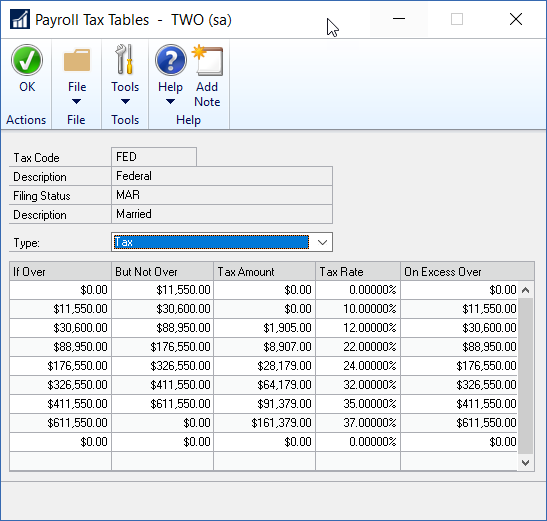 Select the code in the Payroll Tax Setup window. Select the EFICS code first and make the following changes, then select the FICAS code and make the same changes. Click the Filing Status button, then select NA as the Filing Status on the Payroll Tax Filing Status window and click the Tables button. Change the amount in the But Not Over column first row to 132,900.00. 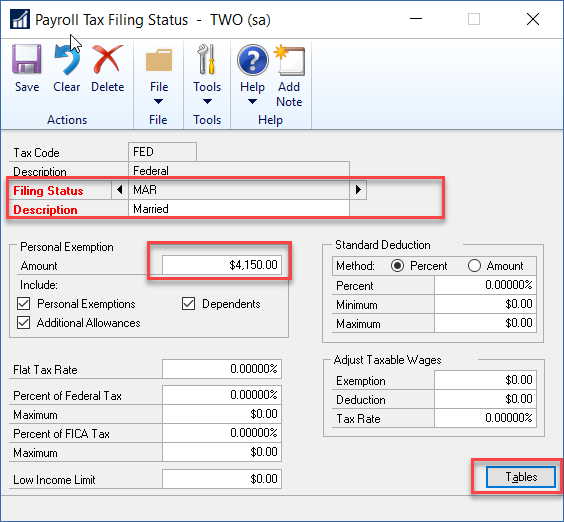 Then click OK on the Payroll Tax Tables window and click Save on the Payroll Tax Filing Status window and close it, then click Save on the Payroll Tax Setup window. NOTE: be sure to change both the EFICS and FICAS payroll tax codes. No other changes are made to either the Social Security taxes or the Medicare taxes. The Tax Rates remain the same for these. The other Payroll Tax Code that has changes is to the FED tax tables. The new rates for 2019 were not available when this article was written. 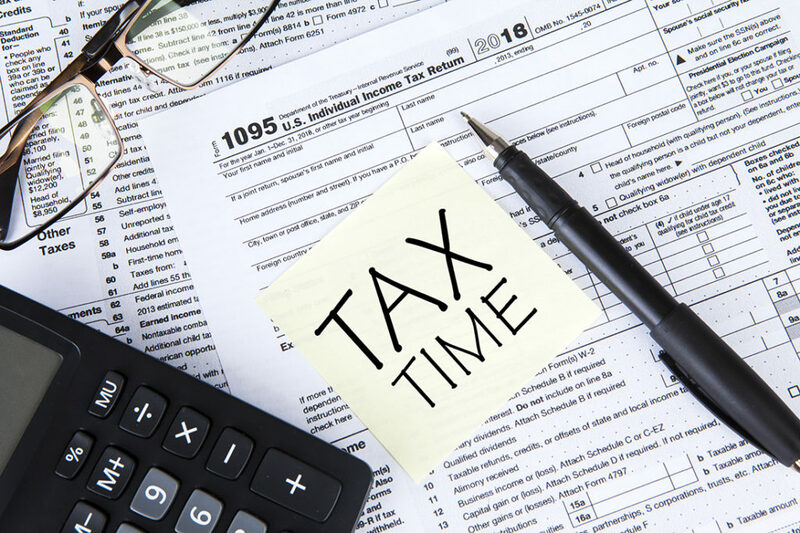 To change the Tax Table you can use the Annual Tax Table that is found in the IRS Publication 15 (Circular E). Here is the link to IRS Publication 15 (I believe this is the same link each year – just be sure the correct year shows on Page 1 (For Use in XXXX). 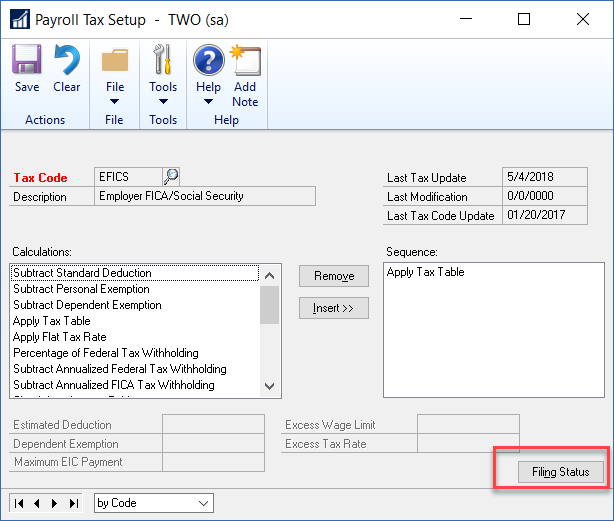 Select FED as the Tax Code in the Payroll Tax Setup window. Select the Filing Status on the Payroll Tax Filing Status window. You will need to change both the Married and the Single filing statuses. Update the Personal Exemption amount on the Payroll Tax Filing Status window. This is found in Table 5 on page 45 of Publication 15 for 2018. Use the amount listed for Annually. Then click the Tables button. Update the Married Tax Table. In 2018 you would have used Table 7 found on page 47. When you compare the Payroll Tax Tables window to the IRS Publication 15 table for the Married Filing Status, you can see how the two are related and should be able to use this information to make the changes for 2019. Click OK on the Payroll Tax Tables window, then click Save on the Payroll Tax Filing Status window. 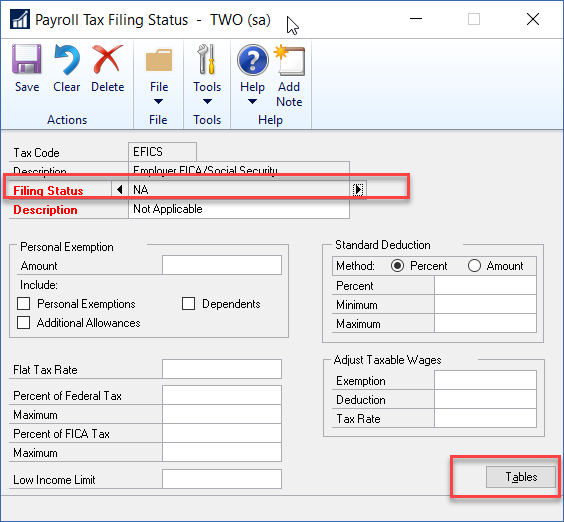 Then change the Filing Status to Single, update the Personal Exemption Amount and click the Tables button where you will update the Payroll Tax Tables window to align with the Single Tax Table from the IRS Publication 15 table. The above process can also be used to update any state tax tables where the Tax Code is equal to the two letter state abbreviation. Each state has their own rules but usually the state has the same setup each year and only the rates have changed. However, if a state made any changes to its tax calculations, you may need to request assistance from support@crestwood.com to set up the state.